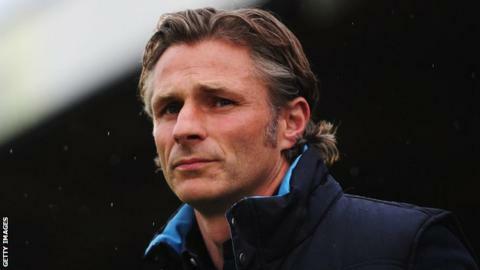 Wycombe Wanderers manager Gareth Ainsworth has said his side will be underdogs in the League Two play-off final against Southend at Wembley. The Chairboys finished fourth in the table, one place above Southend. "It's been great to have a lack of pressure. We're going into it as an underdog, hopefully to cause an upset," he told BBC Three Counties Radio. Last season, Ainsworth's side avoided relegation out of the Football League with a final-day victory over Torquay, while Southend lost in the play-off semi-final against Burton. This year, Wycombe beat Plymouth 5-3 on aggregate at the play-off semi-final stage, and Ainsworth says his team will take the same approach at Wembley. "We're going to approach this game like the previous two games - with a consistent level of attacking football," he said. Wycombe have had the upper hand over Phil Brown's team this season, but Ainsworth believes league form is irrelevant at Wembley. "League form has gone, it is a tournament we've entered into now, and this tournament is called the play-offs. "We're against a real big boy of our league, but we've upset more than one team this year and I don't see why we can't do it on Saturday." Defender Joe Jacobson, who has made 48 appearances for Wycombe in all competitions this season, echoes his manager's positivity. "Everyone fancies their chances: we're doing well at the moment, we're confident and we've won three games in a row," he said. "We've had a good season, worked hard and deserve to be in the final at Wembley." Whether his side win or lose on Saturday, Ainsworth is proud of the club's progression this season. "I am so proud about what we've achieved this year - on and off the pitch this club is going in the right direction. "We now have this one opportunity to make it extra special."